The Iridology International Doctorate Degree program offers a comprehensive overview of the iridological sciences, and explores the continuum of research and development ranging from existing iridological principles to current theories and applications. This iridology degree program offers combined research work of several pioneers including Jensen, Vida-Deck, Gunter, Roberts, Bourdiol, Angerer, Velchover, Andrews, Marcia and Jausas. 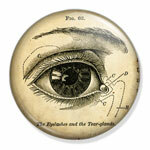 The Iridology International Doctorate program is designed for maximum freedom of study and flexibility. When a student enrolls into the Iridology International Doctorate program, course materials are instantly available via web portal with the availability to access reference material for off-line study. Study materials such as textbooks, manuals, case studies are included in the Iridology International Doctorate program and are immediately available to the student using the on-line library portal. If the student requests research material or textbooks not found in library, the student shall be responsible to acquire such data at their own expense.